Creative Futures- “Adaptation”- Environment Drawings/Progress Design. “Further advice on production is to initially to start out big think massive because all of your ideas will be eventually reduced and if you go with the first concept idea you have you are reducing into even less which the work will not be worth it. 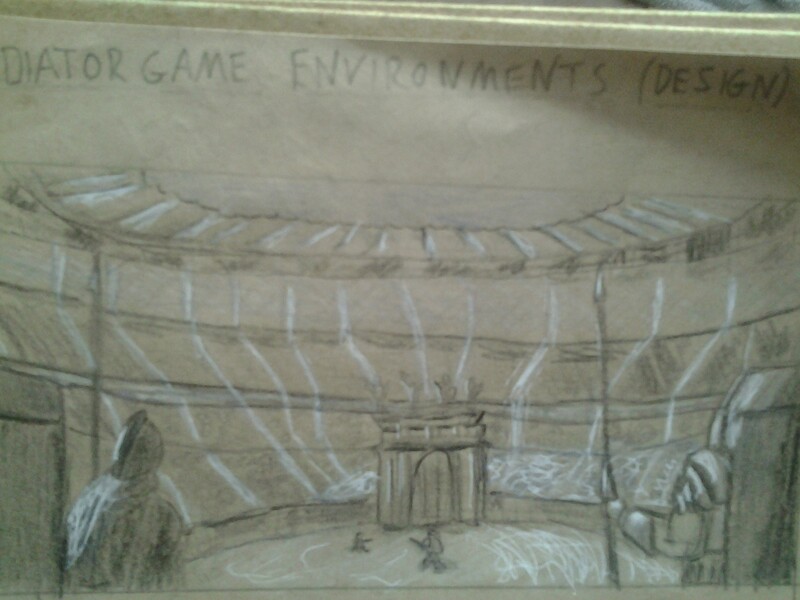 Im going to do a angled birds eye view of the arena and then 2 different perspectives of the arena master and then a gladiator to show different angles and shots of my environment.” Taken from my previous adaptation environment blog. In planning and briefing for my product (initial blog, environment blog, character design) I came up with a series of bullet points to help me focus on what I was exactly trying to get across in my conceptual environment art for my adaptation game. This was what I got down for what will alter your environment and how to make your environment believable and real. From this I tried my best to follow the bullets to help me in the sketching of the actual environments. Arena Entrance to battle view. This is my first drawing for my adaptation environment. The idea with this drawing was to make the viewer feel like he/she was the gladiator going out into battle to potentially lose their life (first person view of the gladiator), this use of composition would further immerse you in the game to make you feel a lot more tense and possibly make a drastic mistake due to pressure. Although I have no drawn the crowd you can imagine the immense atmosphere when you walk into this, so in the game the crowd would be going wild roaring, living and breathing emotions throughout the battle (the crowd was a feature of mine which could alter the balance of the battle dependent on what happens). The guards and pillars/walls at the side are used to represent scale, no picture is perfect and especially when you put things in the way it can give you a idea (definitely in drawings) of how big or small the image behind the obstruction can be, in this case I used the guards in the way as your close they look bigger but then I did some small gladiator outlines already in the ring on a much smaller scale which shows the vastness of the coliseum. Moving onto artistic techniques I used in the drawing. First of all I have already explained scale and how I used that but scale alone would not work without a multitude of other things behind it. Contour Lines I had to use in this image as the curvature of the arena was essential to me as I wanted it to be a dome and not a box, to apply these I did 8 curved lines (a couple to show separation in the stands) but each one was slightly curved either straighter (towards middle) curved in (towards top) or curved out (towards bottom) this for me was a really good effort as I can see the curvature of the arena quite well, it took a few rough outlines of each contour line to find the right one so I didn’t just draw the first one I did it was a elimination process. Also I did lines down the arena (actually light strips coming from the roof slits but still showed my point well) in angled directions to represent what was a seated stand and what was the separation between the levels, the steep gradient lines was the flat foundations for the stands and then the angled lines (varied a lot from angle of light and stand) was the seated areas for the roman crowd. I originally did that in pencil roughly a few times to work out how to do it then I used my white gel pen to go over the top as it was light source from the roof. Then onto shading as it wouldn’t have been complete without some form of realistic shading, I used a white gel pen to show light in rough outlines as it was pure light blinding it would have had some form of shade or darkness factor. This white gel pen I have found a very useful utensil on my two-tone sketch book as it shows up light really well, this can be seen on the guard on the right with the light glimmers on his armour and spear. Other shading I used was just a normal HB pencil for the medium shading as the paper itself could be used as a neutral shade being brown, then a black Faber-castell crayon to do really dark areas such as below the roof near the top or slightly under the armour plating on one of the guards. No particular technique of shading was used just general colouring in sort of zigzag shading as im yet to get used to shading like cross hatching etc. Things I like, so my favourite parts of this picture I have done are: the guards blocking the view, the guards have really been well proportioned by me they are sort of rough outlines with added shading but the fact you can tell they are guards with no facial features (view from back) just a bit of armour/helmet and a spear really pleases me. The shape/curvature of the arena, I found this difficult as I drew multiple rough lines before more solidly drawing a line but the final product I was pleased with. 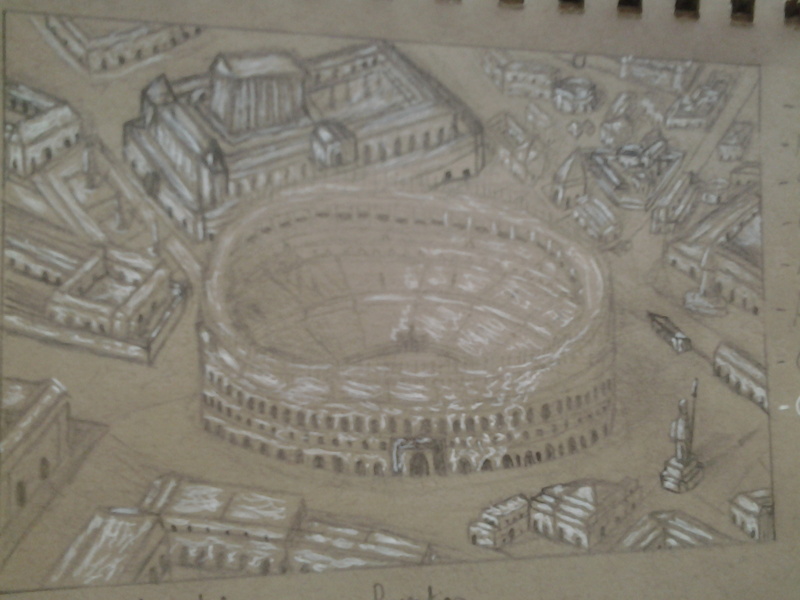 Things I didn’t like, so minor problems I didn’t like were: the level of detail to the arena, no crowd and no sort of roman presence maybe if I had done that centre archway better I could have done a decent statue of a horse on top. The roof, not sure what it is about it but I don’t think it looks right it might be my perspective or opinion but maybe the gradient angle of it isn’t right as its supposed to be arching over the arena , im not sure but I will ask opinions on it to help me work it out. The next step for this would be to draw it again to try and build on what I have already got, then possibly do a digital image in Photoshop. Although I do have a coliseum being built in Sketch Up by myself currently which I could animate to show a fully immersive coliseum. Next time ill be sure to take multiple pictures or scan it in at multiple stages to show progress better and explain added features and decisions throughout (im not sure why I didn’t think of that before). 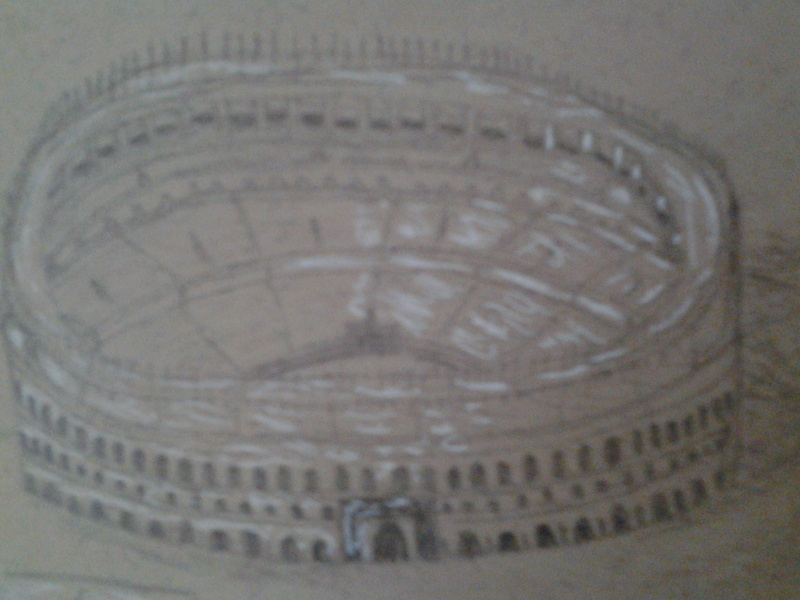 The next drawing will be a birds eye view of the coliseum. Please comment what you think on my image to help me improve my skills further in drawing. Also have a look at my online presence for other blog posts and my work. 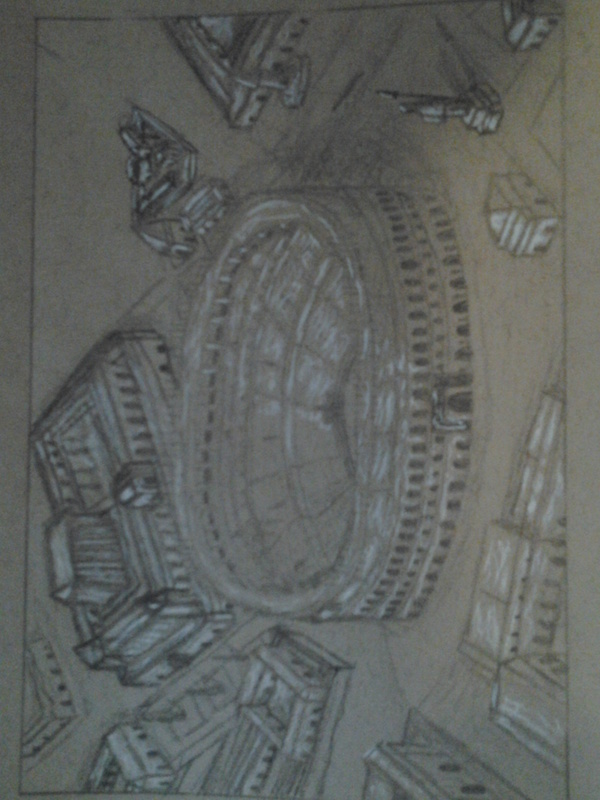 Categories: Creative Futures, Modules | Tags: Colosseum, Drawing, Environment, Gladiator, Light, progress, Shading | Permalink. In the latest instalment of Drawing 101 we was left purely to our own skills and techniques to do a life drawing of multiple items in the room. I chose to draw the mannequin and the art canvas stand to begin with. 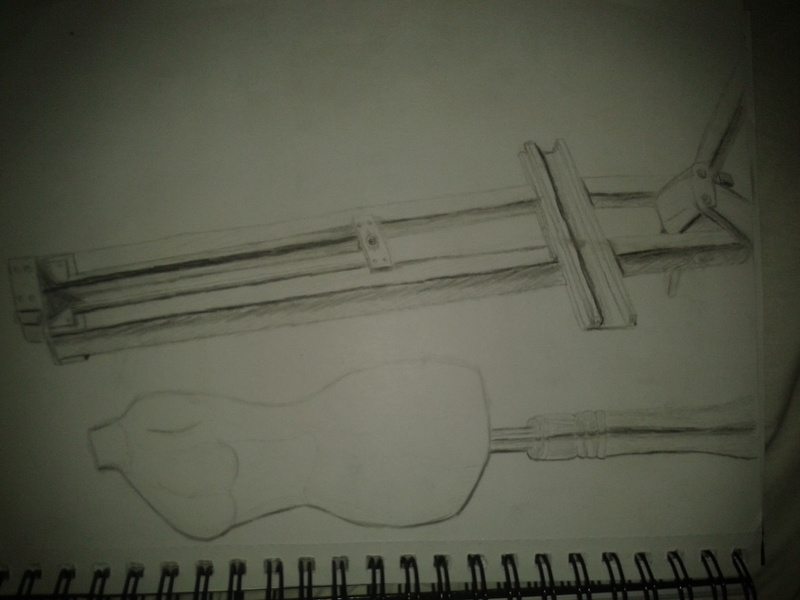 Whilst drawing this I had to use my previous taught drawing 101 lessons and then my own drawing skills. So once I had drawn some guidelines and boxes for the basis of my mannequin I drew the curves in rough over and over to find the line I felt I needed which was then firmly outlined. The shape of my mannequin I was very pleased with so then I added some skills from the last lesson of drawing 101 which was contour lines, this made the breast of the mannequin stand out much better and it also clearly defined the waist. During this drawing I could tell how much I had come on in just 3 weeks with these lessons and it spurred me on to keep practicing as clearly it was improving my drawing. I moved onto the art canvas stand, this I felt in particular the shading I did very well as there was multiple light sources so it wasn’t as easy as I originally thought to properly show the shading. The only problem I came across with the stand was the base I felt after I had drawn it I should have done it in perspective instead of just self presumption. Then once I felt I had spent enough time and practice on the life drawing of the mannequin and canvas stand, I moved on to doing some quick 2minute sketches on some students who were also drawing chosen models, this was a harder test of my art skills as the time set was limited and some people was sat in different positions so contour lines was used on the faces to properly position the facial features and then pure judgement was used on the rest. 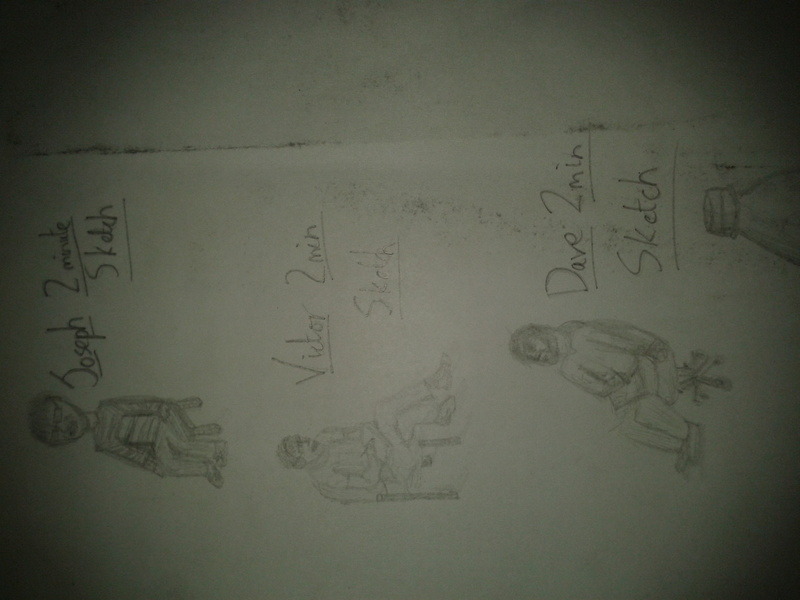 I did 3 people in 6minutes and was pleased with my quick sketches, yes there was problems with certain elements as true detail was unable to be added to the face which is the defining feature of a person but for a quick sketch I felt my sketches were fairly accurate. Finally I went back to basics with one thing I was taught in early years of doing art at school which was drawing and bottle and shading it. 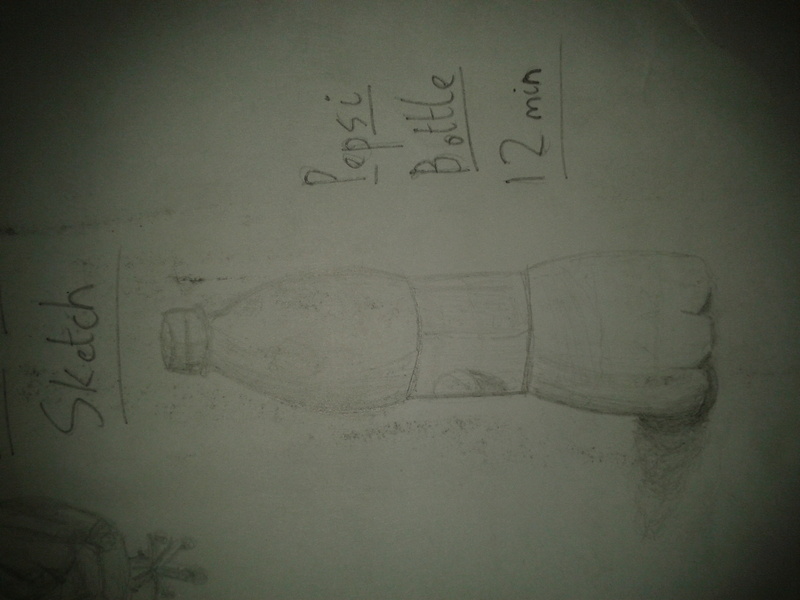 But this time I used contour lines to define the shape on the Pepsi bottle and also thick line/thin line to show the outline. Pencil pressure was key when drawing this as it was a see through bottle with embossed logo in the bottle so this was a challenge I felt I did well, I times it as well and it took 12minutes so wasn’t very fast but detail had been added and care taken in shading and 3d. Overall I was very pleased with my art in this lesson and the progress I have made in these drawing 101 lessons was truly evident to me. This was shown particularly with the use of techniques I had been taught in previous lessons. Categories: Drawing 101 | Tags: art, Contour line, Drawing, Drawing 101, Life Drawing, PHASEgaming, Shading, Shapes, visual art | Permalink. As our first lesson in Drawing 101 we was all took back to the very basics of drawing from doing simple 3d shapes to then shading those shapes by entering a light source on the page. We started by watching a video from a famous designer called Saul Bass who was giving advice to design students. This was the key quotation I took from this video which really hit me as drawing is something I do but never did avidly it wasn’t a primary thing for me it was just a thing on the side I enjoyed from time to time. My tutor then introduced me to the idea of pareidolia, this is the idea that you see faces and things in other items or unusual ways for example: you may see a cloud that looks like a car, or a patterned wallpaper you can see a face in etc. This I found particularly interesting as it made me think that art and design is all around us, we just need to have the vision to see something and think yes this would be artist or a good game. 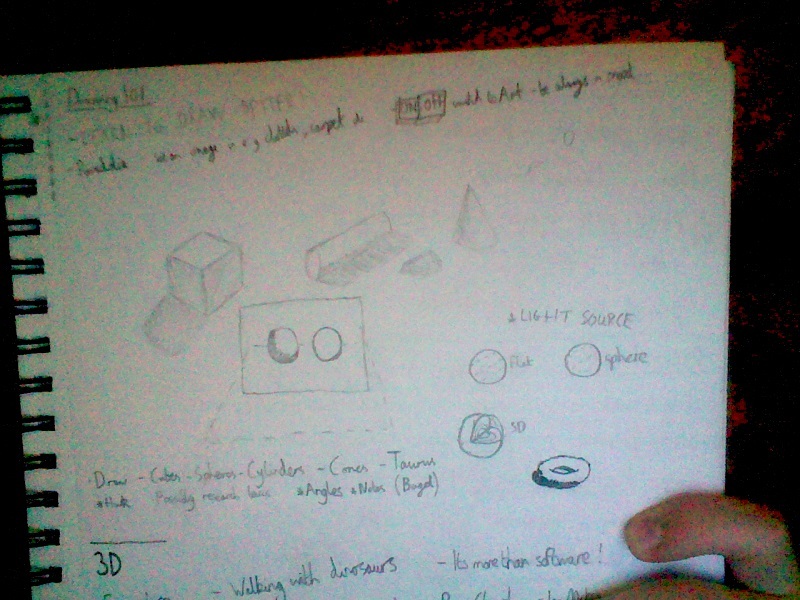 Then came the actual drawing, we was asked to draw basic 3D objects on our sketch pads so a Cube, Sphere, Cylinder, Cone and a Taurus. once we had done this we had to apply shading to the objects using a light source we place on the page. Another thing on this page was the idea of we need to see the page not as a 2d flat page, we need to see it as a 3d plain so we can draw better in 3d. Apparently this will be hard to get used to but the progress in drawing 101 lessons will be apparent. Also we had a go at cutting segments out of shapes so I cut a segment out of a sphere to make it look more 3d. Then for homework we was asked to do the same using different drawing utensils maybe some we are not used to drawing in just to take us out of our comfort zone. So doing this was going to be a test of where I currently was in drawing skills. This is my finished product I used a central light source to test my skills at shadow angles and darkness’s, I also used pencil, pen and fine liner to draw the objects which all gave different effects to the shading of the shapes. As we was told not to use the rubber as mistakes are things to be learnt from I noticed that I am better at cones with shading than I am with the rest. But overall I was pleased with my basic 3d shapes and shading but I will keep practising them as the basics of drawing are the fundamentals to build on. So the main thing I learn from that video and the lesson was I need to practice my drawings even just a little time a day and I will improve, drawing is a fantastic way of showing your ideas to clients that may be interested in your work and that is why I must learn to improve my drawing skills. 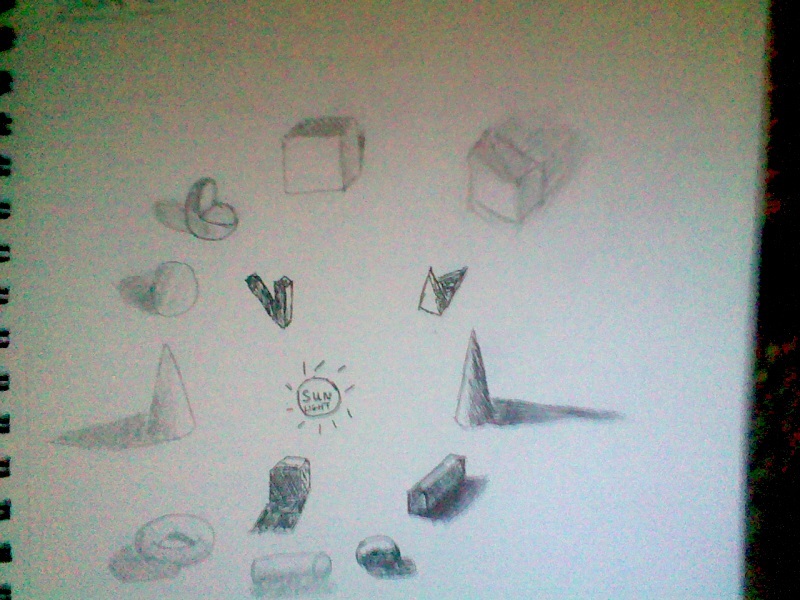 Categories: Drawing 101, Drawings/ Ideas/ Art | Tags: 3D, art, Drawing, Light, Pareidolia, Shading, Shapes | Permalink.